Knowing Peachy and his love for all things flashy, he would totally be into wearing socks. He'd also be into posing for a photo out in a field in the middle of the night. Gotta get that perfect shot to really show off his grandeur. Making a set of a dozen different "ponies in socks" magnets for an upcoming convention (these were first showed in pencil in a thread); managed to finish the entire set. Not sure if all are suitable for the gallery (although none are adult), but I figure at least the Fluttershy one is with its emphasis on cuteness is alright. I'll put up the others later. Its a socks party, what else is there really to say. © All right belong to me, 'cause I made it, but you can do whatever you want with it long as you give credit where credit is due. 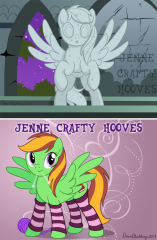 A couple of convention badges I made for Pedestrian Wolf of her personal ponysona. The top image is of her as a "weeping angel", the bottom is her character with the wonderful addition of socks! I like to think Twilight's dads name is Moonlight Sparkle, and her moms name is Starlight. 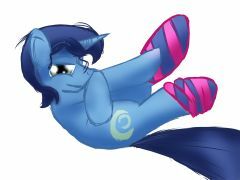 Anyway, have Twi's dad being smexy with socks. Pinkie Pie and Rarity style each other up while I experiment with new art styles. Everypony be stylin'! If anyone is so inclined to color this, go ahead as long as you credit me. The 7th Element of Harmony, Innocence. Derpy Hooves embodies everything i like about MLP:FiM, so this image is my tribute to her. 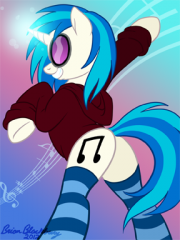 Luna gets a hoodie and socks, well Celestia can be cute too! AN: This was originally written for the Equestria Daily: Midnight Shadow's Happy Luna Fanfiction Competition. FiMFiction Link Description A thousand years is a long time to be away from Equestria. Times have changed, and with that, technology. Can Luna manage to fit into a world that she no longer recognizes? Princess Celestia hopes that a day out in Canterlot is just what Luna needs. Cantering Around Canterlot Princess Celestia awoke one morning, just as she always did, ready to tackle the affairs of the day. Something nagged at the back of her mind, something that she was forgetting today. She ran through a list of current affairs, things she needed to tend to—but none of them were satisfying the feeling. As she stepped out of her room, however, she noticed a peculiar box sitting outside her door. There was a blue ribbon around the box, and a tag attached. Celestia levitated the tag closer to her face in order to read what was written on it. Happy Birthday Celestia Love, Luna Birthday? It suddenly clicked in Celestia's mind. Today was her birthday. Of course, she'd stopped celebrating her own birthday long ago. There was far too much to do to take a day off. Anyway, she got invited to and hosted enough parties and events during the year to make up for that. Celestia had nearly forgotten that she actually had a birthday... It had been so long. So many years had passed... Perhaps it was really because Luna hadn't been here to celebrate with her. A birthday just wouldn't have been the same without—Well, that was in the past now. What was done was done, and anyway... today should be happy. If Luna wanted to celebrate her birthday, than that's what Celestia would do. She could use a day off, in any case. Celestia realized that she had been lost in thought and was still holding the mysterious package aloft. She pulled off the bow, and it fell lightly to the floor. Lifting the lid, Celestia saw a blue lump of something. Pulling it out, she could see that it was a scarf. A rather long one at that too. It was a dark blue, exactly the color of her sister. There were white crescent moons adorning each end, melded carefully in with the rest of the scarf. It wasn't sewn, but... Celestia couldn't remember the correct term for this type of material craft. She examined the tassels at the each end... The entire thing was well made and quite beautiful. But where had Luna gotten it, exactly? Celestia found herself at the doors of the dining hall. She'd been so wrapped up in examining the gift that she hadn't realized she'd subconsciously made her way to her routine destination. Well, breakfast first, and then there was the matter of—No. No working today. Everything could wait. Everything would wait. Celestia took the scarf and wrapped it around her neck. The castle wasn't particularly chilly, but it wasn't exactly warm, either. Besides, it was the perfect time of year for scarves, even if it wasn't normal attire for Celestia to wear. Celestia had tailors asking—no, begging to make her all manner of custom outfits and accessories—but to each she declined. She had no need to wear frilly outfits or expensive jewels. Everypony knew that she was the ruler of Equestria, and there was no need to flaunt that. She pushed open the doors, and was surprised to see Luna already at the breakfast table. Luna's head swiveled around as she heard the ancient door squeak on it's hinges, announcing the new arrival. She looked a bit surprised to see her sister, though exactly why she wasn't sure. Celestia made her way to the table, noticing Luna picking at a bowl of oatmeal. She took a seat directly across from her sister. It would be easier to talk that way. The table was lavishly adorned with fruits and breads and even pastries...but Luna had chosen such a simple thing for herself. 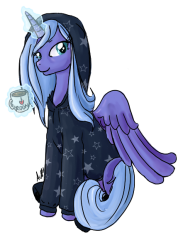 “G-Good morning, Celestia.” Luna stammered quietly, staring at a silver spoon she was swiveling around the bowl. Celestia wasn't sure what he sister's silence meant. She'd given her this wonderful birthday present, and was now strangely silent... Well, perhaps she'd come around. Celestia began to gather different fares from around the table. But the silence persisted, and Celestia couldn't stand not knowing why. “Luna, oatmeal? Are you crazy?” Celestia blurted. Luna stopped her merry-go-round motion and looked up at Celestia. Then she simply shrugged, laying the spoon down inside the bowl, but returning her eyes back to it. Celestia was about to suggest that Luna try one of the tastier pieces on the table when her sister spoke first. “You don't have to wear that you know.” Luna mumbled. Celestia paused, her mouth open in anticipation of a raspberry pastry she was levitating before her mouth. She set it down on her plate, her complete focus on Luna now. “Why wouldn't I want to wear it?” Celestia asked, confused. “It's perfectly lovely, Luna. Wherever did you get it?” “I—I made it.” Luna's head drifted up slowly to meet her sister's gaze. “I was making it just for myself, for practice. You know that I used to like crocheting, and it's been awhile since I've been able to do it... But I just got so excited that I made it far too long before I even realized it, and then I remembered that it was your birthday. And since I couldn't wear it anymore I just thought it might be nice to give it to you, but it really isn't your color and there are probably loads of mistakes on it and—and—and you don't even wear scarves!” Luna's voice had been steadily raising as she'd gone on her rant, and she breathed just a bit faster than normal from her sudden explosion of words. “Luna, you are being ridiculous!” Celestia said. “The scarf is beautiful. I will treasure it always! And it's absolutely the best time to wear it, seeing as it's Fall. And you know what else Luna? WE are going to have cake!” Celestia clapped her forehooves together, and an attendant quickly came to her side. Celestia whispered something in his ear, and he trotted off quickly. Celestia scooted the bowl of oatmeal away from Luna and pushed her own plate away. “But—“ Luna protested, reaching for the breakfast that had been snatched from her, even if she hadn't been eating it. “And—“ Celestia apparently hadn't finished. “—we are going to celebrate YOUR birthday!” She pointed a hoof at her sister at this statement, smirking. Luna herself looked at Celestia in surprise. “But it's not—“ “Doesn't matter.” Celestia interrupted. “I've had far too many. And you've celebrated far too few.” Luna opened her mouth, and then closed it, sighing. “Alright.” Celestia beamed, but she could see that Luna still wasn't into the whole thing. She tapped a hoof on her chin, thinking. Then her face lit up as she thought of the perfect thing. “I know! We'll go down into Canterlot! You haven't had a chance to see it yet. You'll love it Luna! I can never find enough excuses to get out of this castle to see it myself either. So it will be fun for the both of us!” Celestia was grinning. She could also see the tiniest bit of a smile creeping up on Luna's face. “I, uh...I might like that.” One corner of Luna's mouth lifted, much as she tried to hide it. Celestia beamed down at her sister, not even trying to hide her own excitement. And then there was cake. It was nothing really extravagant, and the cooks had whipped it up surprisingly fast. It was just a round cake, although it was a bit larger than average. On top were the words Happy Birthday Princess Luna. There was a single small blue candle, as requested by Celestia. The frosting was a dark blue, much like the color of Luna herself. The wording was white, a perfect contrast against the dark background. Luna gasped when she saw it. “But it's still not—“ “I meant it when I said we were going to celebrate YOUR birthday. I'm just sorry that the cake couldn't be more extravagant.” Celestia said, solemn. “No—no it's perfect!” Luna's face lit up. Celestia smiled down at her sister, glad that she'd finally struck the 'happy Luna' chord. She quickly cut out two generous slices of cake, although Luna's seemed significantly bigger. As Luna grabbed a fork, she glanced across the table, where Celestia was already chowing down on her slice, free of silverware. Celestia looked up and noticed the confused look from her sister. “What?” Luna glanced at the fork she held in the air for a moment. But then she tossed it behind herself, shoving her muzzle onto her plate. This really was a lot of cake... Then again, it had been a long time since she had any cake. She gulped it down with gusto, and when she was finished, she cleaned her plate of any frosting or crumbs. She really was acting like such a foal... But she didn't care, and neither did Celestia. It made her happy just to see Luna happy. Luna licked around her lips, her tongue making happy smacking sounds. Celestia, giggled, covering her mouth with a hoof. “What?” Luna asked, her smile replaced by curiosity. “Oh, nothing Luna.” Celestia made her way around the table to her sister. “Just that you missed a spot. Right HERE.” Her tongue made a slurping sound as it ran up Luna's cheek. The blue pony let out a squeal of surprise as she shivered. Celestia just grinned down at her. “T-That tickled!” Luna exclaimed. But then she burst into laughter, amused by her sister's foal-like antics. She wasn't sure if it was just an act to make her feel better, or if Celestia was really having fun herself. Luna rubbed a hoof against her face, attempting to clean off the slobbery mess. Then she groaned. “Oooooh, I think I ate too much cake.” she leaned back and rubbed her belly. “Well then...” a sly smirk spread across Celestia's face, “...if you can't walk...” she suddenly slipped her neck under Luna, using her head to push her onto her back, “...I'll just have to carry you!” She began to walk towards the door, but Luna started to flail in protest. “I can walk myself!” she flapped her wings, and Celestia felt Luna's weight leave her backside. She promptly landed on the ground next to Celestia, and after dusting herself off, pranced forward with her head held high. But Celestia could see the sly smirk on Luna's face through her high-and-mighty act. “Hey, Lulu! Oh little Lulu!” Celestia called, following after her. Luna stiffened at the nickname, pausing before the double doors that led to the hall. “D—Don't call me that!” she stammered, turning to Celestia with a blush. “Why not, Lu?” Celestia shortened the name this time. “B—Because Tia—“ Luna quickly covered her mouth with her hooves at her slip-up on her sister's name. “I—I mean Celestia. We're not kids anymore, so it's not funny.” But her argument was weak rather than angry. Celestia bent down and nuzzled her sister. “Okay. I promise I won't call you that...” she suddenly threw open the double doors, racing through the front hall to the entrance of the castle, and calling back over her shoulder, “...in public! Come on Lu!” Luna stamped a hoof before chasing after Celestia. She caught up, just as Celestia opened the door to reveal the city of Canterlot spread out before them. Luna blinked in the sudden flash of sunlight beaming into the hall, shading her face with a wing. Wow, Canterlot was huge, Luna thought. Canterlot hadn't even existed a thousand years ago. There were so many cities and towns that Luna didn't recognize. Equestria had once been her home, but nowadays she felt like a stranger in a foreign land. “You know what, I've changed my mind.” Luna turned to walk back inside. But Celestia was too quick, and she grabbed onto Luna's tail with her teeth, pulling her out the door. “No you don't.” Celestia managed around a mouthful of hair. “Gah!” Luna exclaimed, attempting to pull away. But Celestia was bigger and stronger, so it was no use. She stopped in her struggle, allowing herself to be dragged down the first flight of steps, and giving a blustery sigh in defeat. Celestia let go, satisfied, but Luna stayed put on the ground. “Come on Luna!” Celestia stuffed her nose under her sister's belly, urging her to get up. Try as she might to stay in a pouting mood, Luna began to giggle. “H—Hey, that tickles too!” she hopped away from Celestia. But her sister was satisfied; at least she was standing. “Well, I wouldn't have had to do that if you had just walked like you claimed you were so capable of.” Celestia said sarcastically. Luna stood, a scowl on her face now. But she looked into the wise, kind eyes of her sister, and couldn't help but smile. It started out small and reluctant, but quickly spread across her face into a wide grin. She rushed forward, pressing her head against Celestia's chest. “Thank you.” Celestia bent down to wrap her neck around Luna in an embrace. They stood like that for a moment, sharing in the joy of finally being together again. Then Celestia straightened, turning toward the marvelous city of Canterlot. “Come on, let's go.” She and Luna made their way into the heart of the city, where the marketplace was. There, ponies were selling their wares, mostly an assortment of hoofmade items that you couldn't buy in any of the shops. There was jewelery and pottery and toys and pretty much anything else you could imagine. Luna stared wide-eyed at the spectacle for a moment, mouth gaping, and then composed herself. No matter how excited she was, she had to remind herself that she was a princess, and as such everypony would looking to her as an example. She had to show them that she was every bit as sophisticated as her sister, even though she was a little out of practice. “Oh, Luna, come over here.” Celestia said, gesturing with a wing to one of the vendor stalls. Luna curiously made her way over, wondering what sort of new and interesting object she'd find. She saw an assortment of squares, held upright somehow, with ornate decorations around the edges. She took one in her front hooves, picking it up and examining it closely. “What is it?” The stallion behind the stall covered his mouth with a hoof, trying not to laugh at the ridiculous question. Celestia eyeballed him, and he immediately cleared his throat to rid himself of the smile on his face. “Can I help you two find a particular picture frame today?” he name dropped the name of the item to help Luna out. “What's it do?” Luna asked, still squinting at the object in her hooves. The vendor developed a sudden coughing fit, and had to turn away for a few moments while he recovered himself. Then he turned to Luna with a smile. “You put pictures in it.” “Oh.” Luna said, setting the picture frame back down with a blank look on her face. She scanned the rest of the ones sitting around, but none of them gave any further clue as to the purpose of the item. “Luna, come over here.” Celestia had already moved on to another seller, seeing as Luna didn't seem particularly interested in the current one. As Luna came over, Celestia dropped something around her neck. Luna was caught off guard for a moment, letting out an “oof” as she adjusted to the added weight. She looked down at the strange object, and then back at Celestia with a questioning look. “It's a camera Luna.” she smiled down at her. “Just take your hooves like this...” she picked up the camera, pointing the lens toward her sister, “...and then...” Luna let out a sudden squeal at the bright flash that radiated from the camera. She backed up in surprise, knocking into one of the vendor stalls that was selling pottery. The salespony behind the counter glared down at her as his precious clay wares were jostled about. Luna blushed furiously, turning her face away. This was a terrible idea! Luna thought. What appeared to be a square paper ejected itself from the camera just then, and Luna blinked down at it. What now? And then, she found herself staring down at a duplicate of what her own face must have looked like after the flash of light. “How did—“ Luna started to ask, as Celestia pulled the photo from the camera and held it in front of her face, chuckling. Then she presented it back to her sister. “Remember the painted portraits we have hanging in the castle? It's like that, but different.” Celestia tapped her chin with a hoof, thinking for a moment. “The camera takes an immediate picture, and then you have it!” Luna scowled at the picture before her. “Well—just—put it back before somepony sees!” Luna attempted to shove the photograph back into the slot whence it had come. “I'm afraid you can't do that Luna. Pictures are forever.” Celestia grinned. “Well, what do I do with it? What if somepony sees it Celestia? It's embarrassing.” Luna stressed the last word. “Hmm...” Normally, Celestia would have continued the teasing. However, she wanted Luna to have fun today, and as long as that picture was present, Luna wouldn't be happy. So, Celestia grabbed a set of saddlebags, plunking down some bits she procured from... … … … Well, who knows, probably her sentient hair. Moving on, Celestia plopped the saddlebags on Luna's back, although this time she was at least expecting it. She shoves the picture inside one of them, not caring if it got crumpled or torn. It just had to be hidden, now. She didn't notice that the top flap on each side of the saddlebags said I *heart* Canterlot. Then Luna saw something that caught her eye. It was quite peculiar, and unlike anything that she'd seen before. She walked over to the stall, staring at the multicolored fabric. There were several hanging above her on a line between two polls, and many more adorning the counter top. “Oh, what an honor it is to have a princess browsing my humble stock! All of these socks are hoofmade by myself.” she paused. “You know, this pair would really go with your eyes.” The Unicorn salespony behind the vendor stall said. “O—Oh.” Luna said, taken aback. “What are they for?” she asked, taking one in her hooves and examining it. The salespony had turned away for a moment, leaving Luna to solve the mystery on her own. Luna found that there was a sort of pocket on the inside. Contemplating about its use, Luna placed it over one of her ears. Hm, there were two... Although the first one didn't quite fit her ear snugly... it wouldn't make sense to go over the nose though, Luna mused. Wouldn't be able to breath properly or talk. Plus, there was still the matter of the two... The female salespony was busily digging through some boxes of extra stock just behind her and hadn't fully noticed Luna's peculiar antics. “...I know I have the other pair somewhere...” “...and with Winter on the way, this is the perfect time to buy—“ she paused, the second pair of turquoise socks held aloft as she confusedly and rather surprisingly looked at the sock eared princess before her. She placed the socks on the counter, and then motioned for Luna to come closer. Luna tentatively moved forward, leaning over the counter just a bit. The other pony leaned over the counter, coming as close as she dared. She placed a hoof to one side of her mouth, and whispered, “They go on your hooves.”, making a downward motion as she did so. Luna glanced down at the blue ornate shoes she normally wore, and then moved her head back up to quickly scan the multitude of socks. Then she remembered the ones on her ears, and how ridiculous she must have looked. She tore them off, tossing them away like they were hot coals, straight into the face of the Unicorn salespony. She blushed again, hoping that nopony had seen... Oh gosh, this day was turning out just awful. The Unicorn sputtered in surprise, gingerly removing the socks from her face and placing them back down with the other two she had pulled out. “Oh, Luna, come look at—“ Celestia turned from the wares she had been eying, spotting Luna at a different stall. She had thought that her sister was right beside her, but it seemed that Luna had found something that peeked her interest. Celestia excused herself from the Pegasus at hoof, and made her way over to a red face Luna and a flustered salespony. “Oh Luna, what did you find?” she asked, already knowing the answer. “I—uh—socks, I think.” Luna answered hurriedly. “Socks? Ah yes, I can never find them in my size. You know Luna, you should make me a pair. 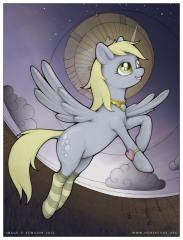 Do you know—“ Celestia said, turning to the sock selling pony, “—that Luna made this scarf all by—“ “I hate socks.” Luna had turned away from the vendor and was sitting on the ground in a rather defeated manner. “—herself.” Celestia finished, turning to Luna. At the same time, the sock salespony shrunk back behind the safety of her vending stall. She cleared her throat and turned away to dig inside one of her boxes of overstock. Celestia caught the upset look on the poor mare's face, though she had tried to hide it. She turned to her sister, who simply sighed, still not looking up. “Luna...” she prodded, and Luna slowly lifted her head up. Celestia gave a quick flick of her head, gesturing toward the saddened pony. Luna glanced over, and became instantly aware of her fumble. She stood up, whirling around toward the stand. “You know what? You're RIGHT!” she moved back up to the counter, and the surprised salespony whipped her head up at Luna's sudden outburst. “These 'socks' are an ingenious invention. They'll especially come in handy when walking around the castle, since the stone floors tend to be cold even in the Summer. 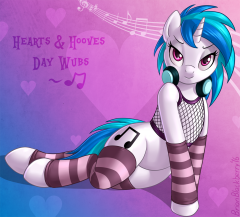 Celestia, I want them all!” she demanded, gesturing across the displayed socks with a hoof, a determined look on her face. Both Celestia and the salesmare were taken aback for a moment. 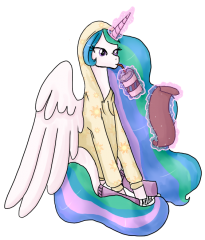 But Celestia was quickest to recover herself, and promptly plunked down a sack full of bits. Luna had already begun stuffing her saddlebags with various colors of socks. However, she picked out four, seemingly at random, and placed them on her hooves. She looked ridiculous, but she didn't care. She found that she was happy making somepony else happy. There were sure to be quite a few ponies who would get a giggle from her antics... and though she was a princess... acting silly gave her a bit of realism. Now she realized why Celestia didn't always act properly, like with the cake, and how she was wearing the scarf. She acted proper at the proper time, and improper whenever it fit the situation. It took the Unicorn a moment to register exactly what had just happened. Her mouth was gaping at the unexpected turn of events. But, it dawned on her that she was still in the presence of royalty, and so she coughed, using the moment to compose herself. “O—Oh my, are you s—sure?” she asked, barely daring to believe it. “Yes, yes, quite.” Luna replied. She had finished emptying the counter of the remainder of the socks, and realized that her bags were getting a little full. 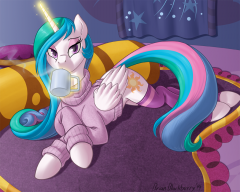 She had realized there were so many of these “socks.” “I'll send somepony for the rest of them later, if you don't mind.” Celestia relived Luna of the dilemma of where in the world to fit more socks. “O—Oh, well I... thank you, your majesties.” The Unicorn bowed graciously before them. “It was really our pleasure.” said Celestia, ushering Luna away with a wing. There was a lot more to see in Canterlot than just plain socks. “Now Luna, come over here.” she indicated to the stall she had been looking at earlier. “Here, try this.” she placed down the bits and thanked the salespony. Then Celestia telekinetically handed Luna something. Luna investigated the item, swiveling it around so she could see all sides. “What is it?” she asked, still skeptical of all the strange new things she was finding. “You eat it.” Celestia said as they walked along the seemingly never ending line of vendors and stalls. She herself was licking the outside, but then she took a bite. Luna watched and began to follow suit. “Well, it does taste good...” she took a tentative bite, and herself unable to move her jaw properly. She struggled against the sticky substance until it gave way and allowed her to speak again. “W—What happened? What is it?” “It's a caramel apple Luna. Aren't they delicious?” Celestia smiled. She was still enjoying her own. “Well—Well, I guess.” she gnawed on hers for a bit, still wary of the new treat. As she was finishing, though, something else caught her eye. She moved toward it, already knowing that Celestia would follow. She stared at the multicolored round objects, which seemed to need to be tethered down by strings. Luna poked one, and it moved away. But then, it began coming back, bumping against her still raised hoof, and then settling in it's original place. “Can I interest you in—oh!” A look of surprise replaced the smile on the salespony's face as Celestia made her way over, and the pony realized just who he was speaking to. He cleared his throat before speaking again, regaining his composure. “Can I interest you in one of these fine balloons?” “What's it for?” Luna asked the stallion curiously. “Well, they're balloons.” he began with confidence. “There are a lot of different colors, and they—well, they float, for one thing... And they, uh... Y'know, they're a big hit with the foals... Foals just get a kick out of them...” He cleared his throat again. “...Maybe it's just not something you'd be particularly interested in...” he hung his head. “Oh no I... I think that they do seem a bit fascinating. You know they didn't have these a thousand years ago...” Celestia already had the bits down on the counter as Luna plucked a pink balloon from the bunch. The Pegasus salespony was flustered for a moment, before tucking away the bits. Celestia was already tying the balloon to the strap of her saddlebags. “Th—Thank you. Come again!” The balloon salespony perked up. Celestia nodded a thank you as she and Luna trotted away. The rest of the day was full of exploring for Luna. Celestia could see that she was finally enjoying herself. After the whole sock fiasco, everything seemed to go better. Luna tried on hats, ate cotton candy, bought a pair of sunglasses, lost several bits gambling, went to a movie, took more photos with the camera, and even attempted to put on a puppet show for some foals. It was an exciting day for all, with both the princesses out and about in Canterlot. But, it was nearly time for Celestia to lower the sun and make way for the moon, thus ending another day. The two sisters walked back to the castle, Luna's saddlebags full of all the interesting items she'd found throughout the day. No matter how useless the object, Celestia had paid for it, because it helped out her subjects, and it made Luna happy. Celestia saw Luna's eyes drooping and her hooves dragging. It had been a long day for both of them. Her horn glowed as she picked up Luna, placing her on her own back. “I can walk... my... self...” Luna trailed off, asleep. Celestia smiled. Today, Luna had finally been able to enjoy herself since her return. And though not even Celestia knew what the next day would hold, she hoped that it would be as pleasant as this one. Luna was home now, back where she belonged. Celestia felt her sister's warm body against her own. It was... comforting, to have her so close after so long. And there was nothing in Equestria that could separate them again. Celestia was sure of that. No matter what it took... They were going to be together. Forever.